At half-time the Belfast Redbacks 7 2 44 led the Galway Magpies 0 6 6. The second half was, if anything, even tougher. The Magpies came back hard in the third term with both teams kicking two goals. Whilst the task was always going to be too big to catch the Redbacks, the Galway team didn’t see it that way – and certainly didn’t play that way. The last quarter remained a tight contest. The Magpies still believed that they had their own story to tell and won the quarter narrowly. It was a grand fightback, proving that they deserved to be in the grand final and certainly would have had the Redbacks grateful for their own big first half. In the end it was that first half dominance which set up the premiership. 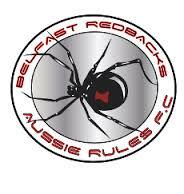 It was the third premiership for the Belfast Redbacks, and arguably their finest as it completed a perfect season. The club will party hard before a well-earned break ahead of planning for a follow-up in 2019. AFL Ireland and the clubs will now turn their attention to the Euro Cup in Cork.